Car, truck, and SUV hoods are one of the first parts of your vehicle to sustain damage from thrown rocks and other road debris. Accidents on the road may also dent and mangle the hood and bumper of your vehicle. 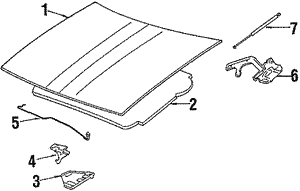 Whatever the cause of your hood damage, the hood may not close tightly or even fit to the frame. A new hood guarantees that your damaged hood won’t fly off while driving and is essential for your safety and others on the road. It also protects your engine components from weather that could lead to rust or corrosion. When safety is your top concern, don’t settle for junk yard replacements or aftermarket products. You deserve the best quality hood crafted by the same people who produced your vehicle in the first place. Purchase your replacement hood from GMPartsNow for a quality product the first time and a reliable factory warranty. We have hoods in stock for dozens of GM makes and models. Hoods come with insulation, washer tubing, and with or without windshield wiper nozzle holes as needed for your model. 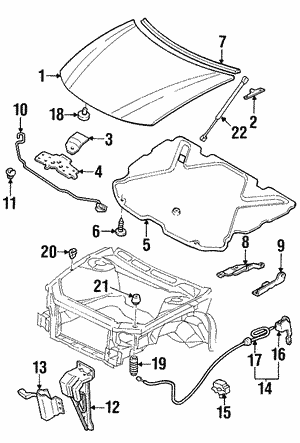 While preparing your repair, be sure to check your hood struts (lift supports), latch (release handle), and hinges. Get everything on time with one low cost shipping fee. And if you’re in need of other things that open and close, check out our extensive selection of doors, trunk lids, tailgates, door locks, handles, and hardware.